On Tuesday, September 29, Hot Shop Heroes: Healing with Fire instructor, Patricia Davidson, and program participant, Army Sergeant First Class (SFC) Peter Bazo from Joint Base Lewis-McChord (JBLM), joined forces to install the new exhibition, Healing in Flames, which is currently on display in the Grand Hall at Museum of Glass. All of the pieces were designed and crafted by soldiers participating in the Hot Shop Heroes program. 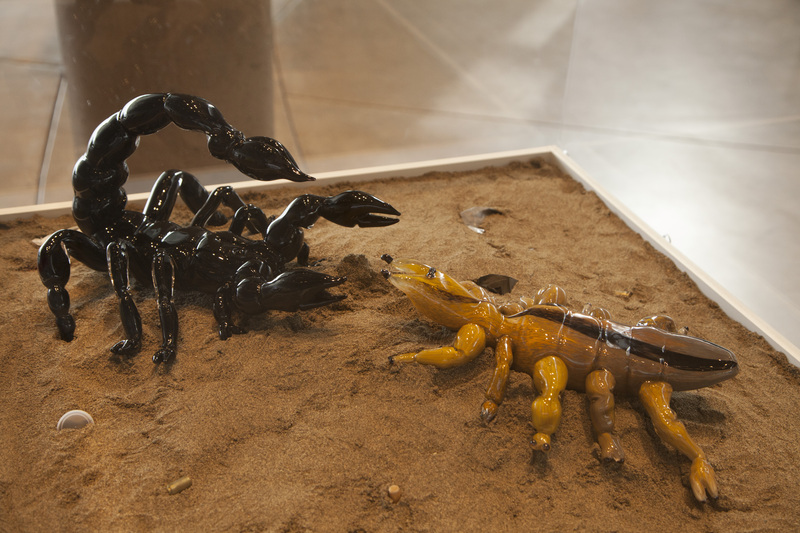 One of the class’ collaborative pieces included in the exhibition, entitled Mortal Combat, features a glass scorpion and camel spider preparing to fight in the desert sand. The piece was inspired by a game often played by deployed soldiers as a way to pass time. The game involves placing a scorpion and a camel spider in a pit—dug by soldiers—where they would engage in a fight to the death. While installing Mortal Combat, SFC Bazo realized something was not quite right with the desert sand. 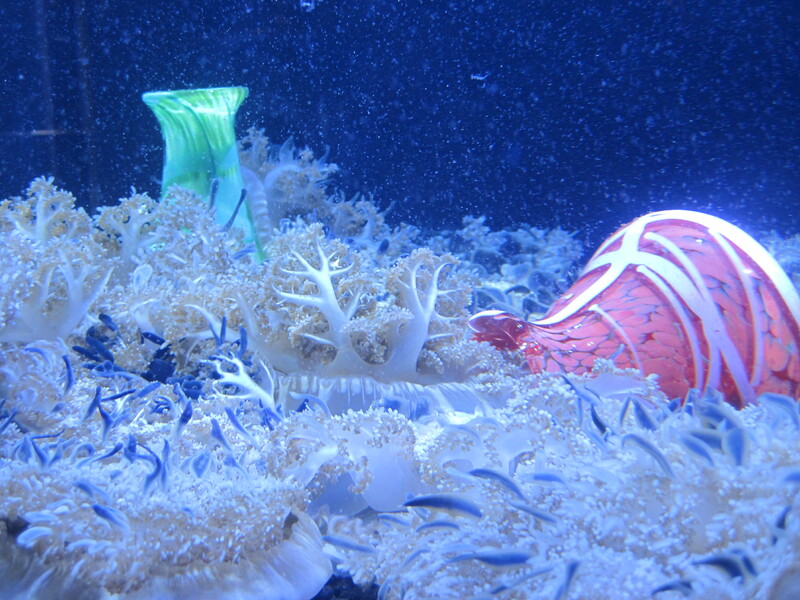 He explained that there is a common misconception about the cleanliness of the desert. Contrary to popular belief, the desert is not a clean place, explained SFC Bazo. In fact, it is just the opposite. As a last minute decision, Bazo suggested a plan: “Why don’t we add random filth to this scene? Here, I have some cigarette butts and spent shell casings to begin.” In the end, Mortal Combat shows the desert in its true form, including cigarette butts, water bottle caps, spent shell casings, and other forms of trash you might see in a war-torn desert. 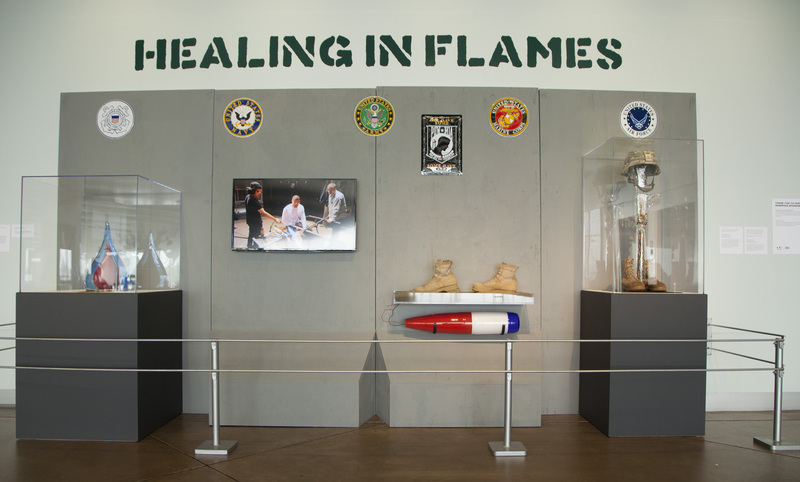 Healing in Flames features several pieces conceptualized and created by the soldiers themselves, under the watchful eyes of instructors Patricia Davidson and Greg Owen, who are both well-established artists in the Pacific Northwest. All pieces were inspired by the soldiers’ experiences while on tours of duty. The exhibition also features a short documentary film created by the soldiers, which highlights their experiences within the Hot Shop Heroes program. The soldiers were quite pleased with the accuracy achieved by the exhibition installation crew at Museum of Glass in creating a representation of the T Wall, a large concrete wall reinforced with rebar used for blast protection purposes in war zones. This T Wall replica displays some of the exhibition’s works of art. Healing in Flames is on display at Museum of Glass through March 2016. Derek Klein is a documentary film maker and has been covering the Pacific Northwest and international glass scenes with Museum of Glass for the past seven years. 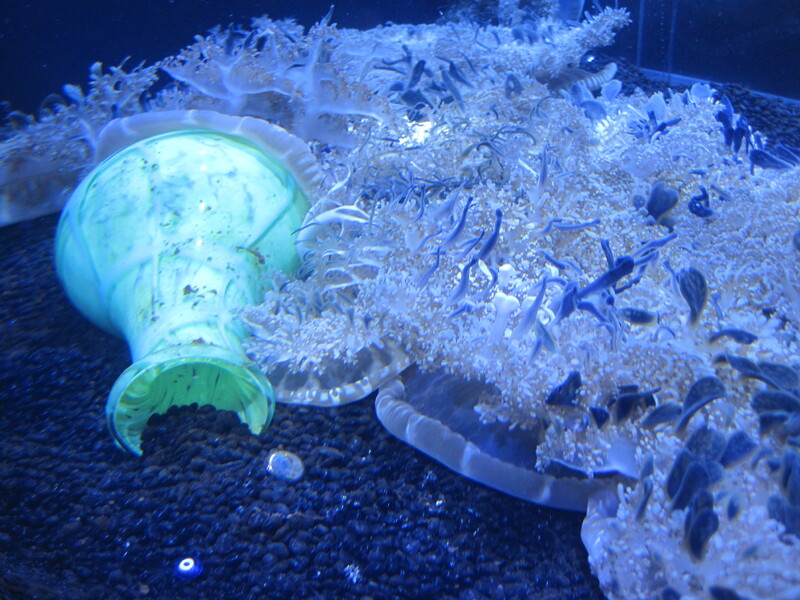 This entry was posted in Art, Exhibitions, Glass, Healing, Military, Museums, Therapy and tagged Army, Art Therapy, Greg Owen, Healing in Flames, Hot Shop Heroes, Joint Base Lewis McChord, Military, Mortal Combat, Museum of Glass, Patricia Davidson, Peter Bazo, Wounded Warriors on October 8, 2015 by Museum of Glass.